Editor's Note: More students have been removed from a Massachusetts school in the investigation of the alleged bullying campaign against a 15-year-old girl who committed suicide, a school official said Tuesday. Nine students at the school have been charged in what a prosecutor described Monday as a months-long campaign of bullying that led to the suicide in January of Phoebe Prince. Bullying is an issue in schools across the United States. 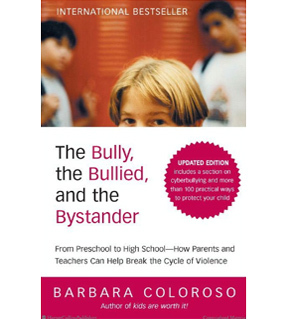 Barbara Coloroso is an author and a consultant on parenting, teaching, positive school climate and nonviolent conflict resolution. She advised the school district on how to prevent bullying. Read an excerpt from her book below. The bully, the bullied, and the bystander are three characters in a tragic play performed daily in our homes, schools, playgrounds, and streets. As the examples in the introduction make clear, the play is real and the consequences can be deadly. A child who is playing “the bully” dresses, speaks, and acts the part, as do “the bullied” and “the bystander.” It is the posturing, the words, the actions, and the consequences of these elements combined that is the concern of this book. Most young children try out all three roles and play each one with relative ease, then abandon the bully and bullied roles to become bystanders. Some children play both bully and bullied and move effortlessly between the two. A few get typecast and find it almost impossible to break out of the role they have mastered, with no opportunity to develop more constructive social skills. Typecasting raises the issue of language. As a former teacher, I have seen how easy, efficient, and nonproductive it is to use language as a kind of shorthand to mold a diagnosis and a child into one entity and use that term as if it encapsulates that child’s entire identity. A child who has diabetes is identified as a diabetic, a child with epilepsy is an epileptic, a child with asthma is an asthmatic, a child with a learning disability is a learning-disabled child. It takes a bit more effort and a few more syllables to say a child who has epilepsy, a child who has asthma, a child with a learning disability. I think it is worth both more effort and more syllables to keep from defining a child by his or her illness or disability. So why use the terms the bully, the bullied, and the bystander? Some argue that to label the participants of a bullying episode is to typecast them and prevent them from moving out of their negative character roles. These writers prefer to focus on changing behavior and avoid labeling participants: the person bullying, the person bullied, the person observing. The emphasis is on providing alternatives for those taking part in or subjected to bullying. Others use labels to intentionally typecast kids, viewing the bullying issue in black and white, as a good guy/bad guy script: “Bullies and Their Victims; the Game of Blame and Shame.” In this view, it’s a matter of them versus us—get rid of the bully and you get rid of the problem. A third option is to use labels as identifiers of certain roles and the behavioral characteristics of those roles. I choose this option. When any one of these terms—the bully, the bullied, or the bystander—is used in this book, it is intended to identify only a role that a child is performing at that moment, in that one scene of the bully, the bullied, and the bystander one act in a longer play. It is not intended to define or permanently label a child. The goal is to gain a clearer understanding of these roles and how the interactions involved in such role-playing, though commonplace in our culture, are not healthy, not normal, and certainly not necessary and in fact can be devastating to children playing any of the three characters. Once we understand these roles, we can begin to rewrite the script and create alternative, healthier roles that require no pretense and no violence. We can rechannel the governing or controlling behavior of the bully positively into leadership activities. The nonaggressive behaviors of the bullied can be acknowledged and developed as strengths. The role of bystander can be transformed into that of a witness: someone willing to stand up, speak out, and act against injustice. Our children are not merely acting out their scripts, they are living them. They can’t go home after a performance and “get real,” because home is a part of their stage. But the scripts can be rewritten, new roles created, the plot changed, the stage reset, and the tragic ending scrapped. The actors can’t do it alone. We adults have to get out of our seats—we cannot afford to be a passive, inattentive, bored, alarmed, or deeply saddened audience. We can’t walk out, close the show, and send it somewhere else. We can’t merely banish the bully and mourn the bullied child. It’s the roles that must be abandoned, not our children. Our children need a new play, and we adults can become active participants in a total rewrite. Before we can begin the rewrite, though, we need to analyze and understand the original tragedy. My daughter was bullied quite a lot. Teachers always said but she seems so happy. I have poems that she wrote about faking happy with a simple smile, while the feeling of being punched in the gut was her average day. In seventh grade she made cheerleader and "a friend" put medicine in her food for 3 days. The school refused to tell me what actions they took, but what I understand is that she was suspended for 1/2 day and her parents took her to a Justin Timberlake concert. The principal told me to keep it quiet and not go to the police and they told my daughter that she should be a better advocate for herself. She was afraid for her safety a lot, because she had no one to go to. She felt bullied by a teacher and principal. This is only a small part of what her youth has been. I had to let her move with her grandma last week and it kills me. With jobs and such I can't go with her. I miss her, and I love her. BUT she is smiling now! I'm always amazed by adults that investigate bullying in school. I am an honor student that was "bullied" by my "vice principal" at my middle school during the second half of my 8th grade year. The bullying started after I pointed out that the school didn't follow protocol when dismissing (kicking out) kids out of NJHS (National Junior Honor Society). The Vice Principal would pull me aside in empty hallways and threaten, taunt, and ridicule me. She would tell me there is nothing I can do to stop her. She was correct for the most part. I watched her not only bully me, but other students throughout the year. You should look into "Teacher Bullying", I think you would be amazed at how wide spread the epidemic truly is. So why isn't "Teacher Bullying" reported very often? There is usually no one willing to corroborate your claim for fear of retaliation by teaching staff. Mr. Cooper, I doubt if you'll investigate. And, BTW, the Vice Principal headed up the "anti-Bullying" campaign at the middle school and the NJHS program. thanks for talking about that subject, that book seems interesting and I would have loved to hear more from the author Barbara (during the news) about the psychological aspects of those drama. I guess it's a history of violence and "fear of the others" that happen in a lot of social groups and that somehow may influence the children, a group of children may be "the bully" because they're afraid to become the next bullied... I think the teachers and responsible should find a solution to stop "communitarianism" against one person! I've been a victim of being bullied. I had a teacher bulley me and two of my friends daily. We took it to the principal. After meeting and discussing what had happened we still remained in the same class with the same teacher. It seemed like nothing ever happened, except me and friends never felt very safe. Who's responsible for the childrens safety when not at home? I am glad that you included Barbara Coloroso in your program this evening. Our son was bullied in middle school and the administrators passed it off as 'middle school kids being kids.' His personality started to change, his self esteem started to change... Our son is a wonderful, smart, handsome young man who was taught to be kind to others. Ultimately, we made the difficult decision (encouraged by our son) to teach him from home. I quit my job as a CFO and became his full-time teacher. His self-esteem and personality have returned and he often shares his experience with bullying to help others. It's unfortunate that this is the choice that we had to make, but our son's life, and his character, is well worth it! How can anyone expect these kids to take responsibility when the administrators and school staff do not? While this school superintendent appears less than credible, this is an issue that is occurring in many schools across the country. Small towns are a breeding ground for this behavior, because of the lack of acceptance of anyone who doesn't quite conform to their norm. They also lack resources to keep children in their community engaged. Their sport- drugs and hatred. Why do the adults involved not have a clue? Frequently they are not a part of the community, they don't care about what happens to the kids once they get the heck out of Dodge at 2:00pm. I think your focus on the story about this child is misguided. As the mother of a 17 year old who looks remarkably like this girl and who attempted suicide while I was out shopping for a Christmas tree, I can tell you that on the ground the parents are blaming themselves. I don't know what happened at my daughter's high school and I probably never will. I do know that she cried throughout entire classes and no one from the school ever called me. I also know now that teen suicide (and suicide for all age groups) springs from a complex state of mind that is not completely understood. Suicide is noone's fault – it mostly springs from major depression and the feeling there is no way out. Focus on teen suicide and the causes. There is no greater agony than the loss of a child to this. The superintendent is not the fall guy. Speaking of bullying; what is the answer to bullying women and children about sexual issues on the internet. I have found this to be a global problem. What happened to a good conversation that is not rude?